Childages 3-11 Under 3 are free. For over 45 years, Niagara Helicopters Limited has been thrilling passengers of all ages with the highest, longest, most spectacular view of Niagara Falls and all its wonders from one of five meticulously maintained Bell 407 helicopters. As the helicopter gently lifts off from its base location, the awe-inspiring views of the Niagara Region begin to appear below. Cameras should be ready to go right from the start! The green grass and floral beauty of Queen Victoria Park stretches below as the helicopter passes by the American Falls and the Skylon Tower. Just when it looks as if you may reach the Minolta Tower, the helicopter begins to change direction as if following the curve of the Canadian Horseshoe Falls! Rainbows appear and disappear from all directions. The helicopter begins to level off and continues along the route back to base. 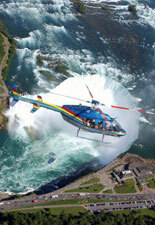 The heliport is centrally located along the Niagara Parkway, just minutes from the Falls. 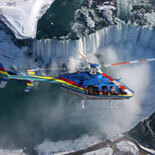 Niagara Falls Helicopter Rides are honored to welcome thousands of visitors from all over the world each year. For your convenience, individual headsets with taped commentary are available in 12 languages including English, French, German, Japanese, Spanish, Italian and more. On-site services include a Gift Shop featuring exclusive Niagara Helicopters collectibles, a Gourmet Cafe serving hot and cold meals and a Photography Lab producing personalized, high-quality photos of you and your loved ones. 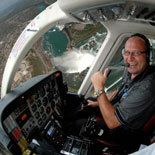 So make your reservations today, get your eTickets and take the ride of your life with Niagara Falls Helicopter Rides! 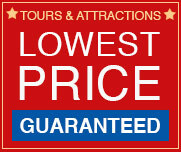 Tours depart daily year round from 9:00 am to sunset | weather permitting | Limited hours on Christmas Eve | Closed on Christmas Day. River Road/Niagara Parkway and Victoria Ave.
Child Ticket: ages 3-11 | Under 3 are free. Reservations are not required, this is a walk-in attraction. Please call to make sure they are flying! Details will be on your eTicket. 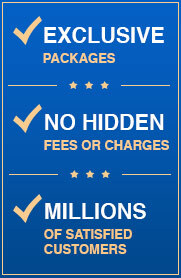 Passport is required for traveling to and from the United States.